The first launch from a newly christened commercial spaceport on the coast of Virginia will haul a U.S. military experimental tactical satellite and a tiny research craft into space Monday morning. Engineers are spending the weekend conducting final preparations for the mission, which is scheduled to begin as early as 1200 GMT (7:00 a.m. EST) Monday, or less than 10 minutes before sunrise. Monday's launch window extends for three hours. The four-stage Minotaur rocket will blast away from its seaside launch pad at the Mid-Atlantic Regional Spaceport on the southern tip of NASA's Wallops Flight Facility on the Delmarva Peninsula. 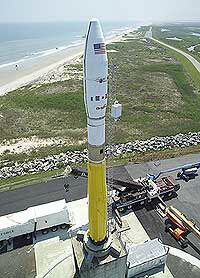 The rocket will fly southeast away from the U.S. East Coast before deploying its payloads over the Atlantic Ocean. Developed by Orbital Sciences Corp., the Minotaur combines a unique blend of hardware from heritage missile and rocket programs. The launcher's first and second stages use solid rocket motors from decommissioned Minuteman 2 ballistic missiles. The solid-fueled third and fourth stages come from designs from Orbital's commercial air-launched Pegasus rocket program. The weather outlook for Monday morning appears favorable, with forecasters predicting partly cloudy skies and westerly winds of about 10 knots. Temperatures are expected to be in the mid-30s, said NASA spokesman Keith Koehler. The launch could put on a spectacular light show for millions of residents in eastern Virginia and Maryland as the rocket ascends into sunlight. Tucked away inside the Minotaur booster's modified bulbous 61-inch payload fairing are the U.S. military's TacSat 2 demonstration satellite and the 10-pound GeneSat 1 spacecraft for NASA. All five previous Minotaur missions used a standard nose cone based on the fairing used by the Pegasus rocket. Both payloads are destined for an orbit roughly 255 miles high with an inclination of around 40 degrees. The 814-pound TacSat 2 spacecraft carries a slate of 11 experiments to be conducted during the satellite's mission, which could last up to one year. One of the primary objectives of the mission was a rapid design cycle, construction and launch of the satellite, which was first approved two years ago, according to an Air Force statement. Officials expect the craft to be declared operational just a day after launch if all goes as planned. Many of the experiments aboard TacSat 2 focus on tactical objectives, such as testing communication links between ground stations in the United States and military units deployed overseas. Critical imagery of theater operations could be transmitted through the spacecraft, according to military officials. TacSat 2 will also attempt to demonstrate autonomous operations, a RoadRunner onboard processor, a GPS occultation receiver for navigation and 500-watt recycled solar panels for power production. The project is jointly managed by the Air Force Research Laboratory, the Space Development and Test Wing, the Naval Research Laboratory, the Army Space Program Office, Air Force Space Command and the Space Warfare Center. A small secondary payload for NASA is also on the cargo manifest for Monday's launch. GeneSat 1 will test the affects of spaceflight on bacteria samples carried inside the satellite's miniature laboratory. The E. coli bacteria samples are similar to those used to help digest food in the human body. Biological test results will be monitored for about four days, but ground controllers will continue to track the craft's systems for up to a year as it continues to circle Earth. The mission also includes a significant contribution from University students. Monday's launch will be the first orbital mission to originate from Wallops since 1999, when a Pegasus rocket was launched from the belly of an L-1011 jet offshore. It is the first attempted ground-launched space mission from the site in more than 11 years.